Parking: Large car park in the grounds (grid reference SE 712 701). 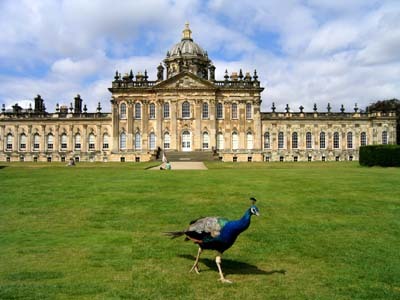 Castle Howard is 15 miles north east of York, just off the A64. Then follow the brown and white tourist signs. Map: Pick up a leaflet on the way in - inside is a section entitled 'How to find your way around'. Click here to see the map in the leaflet. Castle Howard is a magnificent stately home that has been lived in by successive generations of the Howard family since it was built in 1699. It is one of England's finest Baroque mansions, and was the conception of Charles Howard, the 3rd Earl of Carlisle, with Sir John Vanbrugh as his architect. Currently the Hon. Simon and Mrs. Howard live there with their two children. Included in the admission price you will be able to enjoy the House including a Maids & Mistresses exhibition and Brideshead Revisited room. Historical Costumed characters will tell you what Castle Howard was like during their lifetimes. A series of outdoor tours are available which look at the grounds and Estate in different ways such as architecture, archaeology and waterways. In addition the grounds make for an excellent stroll with the flora and fauna changing throughout the seasons. There are also many special events held there each year including the Castle Howard Proms Spectacular, More 4 Kids activities, musical afternoons and more. Information regarding events can be found on the website. The walk described below is an excellent starter to build up an appreciation of the splendour of the House and the grounds, before treating yourself to some refreshments and a tour of the House. From the car park, pass through into the stable courtyard where the ticket office is situated. On exiting the Courtyard in the direction of the house, turn right and then left to walk alongside the outer wall of the rose garden. A gate on your right then takes you into the rose garden. The colours in the spring and summer are fantastic with numerous varieties on show including the famous Castle Howard roses, which are at their best in June and July. Stroll at your leisure through the many paths in this garden and then leave by the same gate that you entered. Turn right and continue towards the House. On your left is an archaeological dig where you can watch a team of archaeologists and volunteers as they search for the village of Henderskelfe, which was relocated when the House was built. Just past the dig turn left and pass through the Boar Garden making your way down the side of the House. Having past the House turn right along the main drive that passes the North front of the House. From here enjoy are magnificent views of the House, the Great Lake and the surrounding area including the North Yorkshire Moors in the distance. Continue along the drive and follow it around to the left and away from the House. The drive leads down to the Lakeside café and adventure playground. Just before reaching the café, the path forks. Take the right hand fork that bends around to the right and enter into Ray Wood. The path followed through Ray Wood is mainly straight and leads through to the site of the Temple of Venus. There are however many side paths leading from this main one, which lead you further inside the wood enabling you to see more of the seasonal changing woodland flora, birds and wildlife. The path exits the Wood at the site of the Temple of Venus. 1 Hawksmoor's Temple of Venus, an open rotunda of eight Tuscan columns under an octagonal entablature and dome, this Temple was built in the 1730s, but it collapsed in the 1940s. From here turn right and follow the path by the wall up to the Temple of the Four Winds, which can be seen up ahead. 1 Early in 1724 Vanbrugh sent some designs for a pavilion for the south-east corner of Ray Wood, and by February he was pleased to learn that the 3rd Earl had at last chosen the Temple with four Porticos. Known originally as the Temple of Diana, the Temple of the Four Winds - a cube with dome and porticos - is modelled in part on Palladio's Villa Rotonda in Vicenza. By the time of Vanbrugh's death in 1726, the Temple was unfinished and another ten years were to pass before the interiors were finally decorated with scagliola in 1738 by the stuccoist Francesco Vassalli. From here there are magnificent panoramic views of the surrounding area, which also include the New River Bridge and the Mausoleum. 1 The Mausoleum was built by Hawksmoor. During the 1720s, after a quarter of a century of continuous building projects, the 3rd Earl's thoughts turned toward death. 'I do design to build a burial place near my seat of Castle Howard, where I desire to be layed', he wrote in his will; and his correspondence with Hawksmoor between 1727 and 1729 is full of references to buildings from the antique as possible models. The building is cylindrical in shape, resting on a square base, and surrounded by a colonnade of twenty Tuscan columns, which inside are echoed by eight fluted Corinthian columns. The foundations were laid in 1729 but Hawksmoor soon found control of the project wrested away from him as problems and revisions dogged the project during the 1730s. His designs were substantially altered by a triumvirate of gentleman architects - Carlisle's son, the future 4th Earl; and his son-in-law, Sir Thomas Robinson; and their friend Lord Burlington. The final version included a set of steps on the eastern side, and the bastion wall, added by Daniel Garrett in the early 1740s. A stunning architectural landmark from wherever one spies it the Mausoleum contains, above the vaults, a chapel lit by large windows and a clerestory some 70 feet high, and a splendid coffered domed ceiling. There is no public access to the Mausoleum. A wide grassy terrace leaves the Temple of the Four Winds back toward the House. Several statues are situated along the side of this terrace and in the spring the bank is covered in daffodils. For this walk however we need to ignore this terrace and head to the left of the Temple of the Four Winds. Head down around an area of stone slab and in front of some trees and bushes, to follow the more minor path which a leads you only few yards further to arrive at the waterfall. From here continue up the side of the water past the shepherd boy and up to the cascade, which marks the start of the South Lake, which contains the Prince of Wales Fountain. Behind you now there is a wonderful view of the Mausoleum with the New River Bridge with the top of the Waterfall in the foreground. Follow the path across the top of the cascade to walk around the far side of the South Lake heading back towards the House. Over to the right there are wonderful views of the House with the Prince of Wales fountain in the foreground. At the top end of the water, continue straight-ahead turning right just before the hedge which surrounds the Atlas Fountain. Turn left to arrive at the Atlas Fountain. 1 In the 1890's Rosalind, the 9th Countess of Carlisle swept away the elaborate parterres of W A Nesfield and replaced them with today's lawns and hedges. The Atlas fountain sits on the centre, designed by W A Nesfield as part of the New Pleasure Grounds in the 1850's. The five figures carved in Portland stone by John Thomas, were transported to Castle Howard railway station by steam train. The fountain was turned on for the first time in October 1853. Atlas was made to stand at the edge of the earth, supporting the heavens above on his shoulders. In the grounds around here are various statues such as the 'Dancing Faun', 'Hercules and Antaeus' and Pluto and Proserpine. The view over and around the fountain provides fantastic views of the House. From here visit the House itself and the remainder of the gardens before returning to the car park. 1. Words and some pictures by kind permission of the Castle Howard Estate Limited.